26 April 2016 marks the 60th anniversary of the maiden voyage of the Ideal X and the birth of modern container shipping, a development that played a critical role in spurring the global economy. One visionary, Malcom McLean, features prominently in the industry’s development. But the modern shipping container has changed much more than one industry. It has radically transformed supply chains, fundamentally changed domestic and international economies across the world, and changed societies in the process – all the while driving trillions dollars in annual trade. For centuries the expense, risk, and frustration with ocean freight held back expansion of the international economy, despite the invention of the steam invention. Break-bulk loaded cargo was poorly secured required a Tetris-like approach to handle diverse sizes of packages. Loading and unloading was particularly troublesome. Risks include delays, pilfering, damage and loss. Early examples of intermodal containers include railroads from 1830s (various sized containers), and Pennsylvania Railroad regular container service (1929). Small trucker, Malcom McLean, fumes at slow loading of cargo aboard ship – “There has to be a better way.” The founder of modern intermodal container shipping conceives the concept of the modern shipping container. US Army uses the “Transporter” container, developed four years earlier for removals, for Korean War supply movements. First use of a modern container for ocean freight. Western Europe selects container standards for rail, also intended for ship and truck. First shipping container regulations, promoting international container shipping. McLean purchases a steamship and a railroad terminal company. He forms Sea-Land Service, and experiments with container design. First infrastructure to support intermodal container shipping. Following McLean’s patent, containerized shipping saw a series of firsts from 1956, as container services expand to become international, transatlantic, and transpacific. From 1968, with intermodal container shipping proven, the container fleet rapidly expands. It wasn’t just about freight. A patent was filed in 1962 for using shipping containers as touring exhibition booths. Ideal X (aka Maxton) ships 60 containers on deck from Newark, N.J. to Houston, where the shipping containers are loaded onto trucks. The next year, Pan Atlantic ship Gateway City begins the regular service. First intermodal cargo transportation (containers are stacked on deck). Then, the first storage of containers below-deck. McLean’s invention of the system called fitting, helps lifting and fixing of containers onto vehicles, and fixing to each other. Loading costs plummet. From $5.86, they are currently $0.16 per ton. Fitting facilitates cargo security and enables automation of container handling processes. The first quayside container gantry crane, “Portainer”, is developed by Paceco. Gantry cranes slash loading times, cost, damage, and pilfering. Elizabeth-Port Authority Marine Terminal, N.J. opens. First dedicated container terminal. Sea-Land initiates first transatlantic service, following in 1967 with first transpacific service. McLean convinces the US Army that shipping containers provide a more reliable service (also eliminating dockside pilfering by Viet Cong sympathisers). Nascent Asian-US trade drives the return service. Grace Line had instituted the first international service, US to Venezuela, in 1962. The beginning of the Asia-Advanced Economies trade boom. Large carriers can no longer ignore containerized shipping, signalling the demise of the conventional cargo ship, lengthy stays in port, etc. ISO 338, ISO 790 and ISO 1897 set standards for containers. International standards promote development of intermodal container shipping. Once the concept was validated, the container shipping industry grew exponentially in the 70s and 80s. 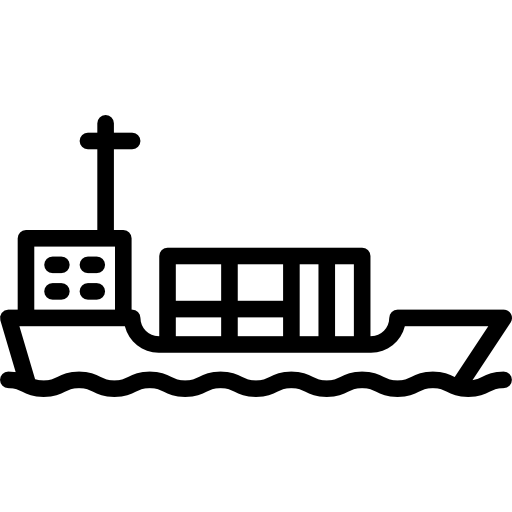 By 1973, US, European and Asian container ship operators are carrying 4 million TEUs. Export manufacturing starts moving away from ports. In the early 1970s, UK architect Nicholas Lacey writes his thesis about converting shipping containers into habitable dwellings. Registered longshoremen on the U.S. East Coast falls by over two-thirds from 1952 to 1972. Example of the massive decrease in dock workers as a result of containerisation. With the growth of transpacific trade, McLean teams with Southern Pacific Railroad to build the first double-stack train car. Development of intermodal container shipping is impacting other transport modes. Airline Deregulation Act becomes law, the first of a wave of American transport deregulation that continues through until the mid-1980s. Companies can now own stakes in several transport modes, enabling the growth of intermodal carriers. Shipping between Europe, S.E. and E. Asia, South Africa, Australia/NZ, North America and South America are all largely containerized. Most international ocean cargo is now containerized. 90% of countries have container ports, up from 1% in 1966. By 1983, container ships are carrying 12 million TEUs, with trade routes extending to the Middle East, South Asia and Africa. In 1989, the world’s largest shopping mall built from shipping containers, with 16,000 vendors, opens in Odessa, USSR. Competition for container traffic is increasingly giving way to coordination between the ports of Los Angeles and Long Beach. Example of the increasing coordination between seaports as a result of containerization. 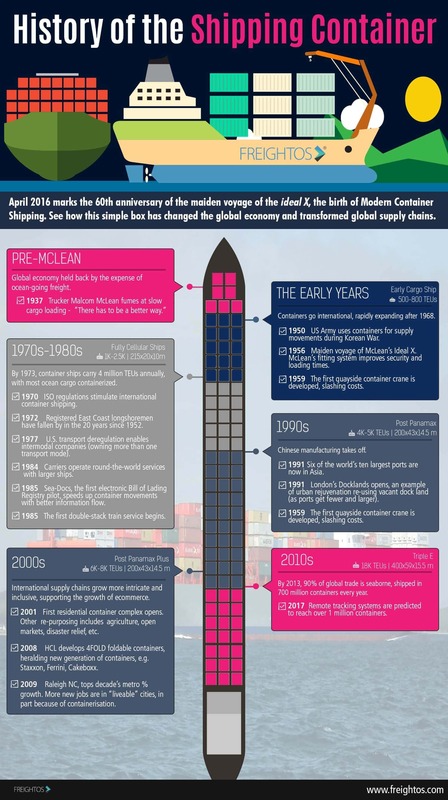 McLean, now owning US Lines, develops a new carrier business model of jumbo container ships providing a round-the-world service, intersecting with smaller, regional ‘feeder’ services. Costs fall and service improves. Along with the new sea-carrier alliances (effectively merging fleets), this supports Just In Time (JIT) production supply chains. The first all double-stack train is developed by APL and UP Railroad. Its first trip includes transfers to two other railroads. Containerization is driving technology in other transport modes. Sea-Docs is the first electronic Bill of Lading Registry pilot (albeit for oil cargo). Carriers look to process improvements to increase container cargo shipping. Over 100 double stack container trains, each a mile long, are now operating across U.S. Intermodal companies make car operations more flexible, especially for linking to other lines. More types of goods are traded economically, and much manufacturing is transferring to developing economies. The rapidly developing Chinese economy rescues hundreds of millions of Chinese citizens from poverty. In 1994, a BBC series is made on the conversion of shipping containers for office space, the first mass media exposure of the concept of using containers for other purposes. Ceiling year of a study of 22 industrialised countries (Uni. of Nottingham) which isolates the impact of containerisation on bilateral trade. The study also isolates the impact of bilateral free-trade agreements and GATT membership. Containerization (790% increase) impacted trade growth much more than bilateral free-trade agreements (45%) or GATT membership (285%). Canary Wharf buildings in London’s Docklands opens. What was once the world’s largest seaport closed to shipping in 1969. Example of urban rejuvenation re-using vacant dock land (as ports get fewer and larger). Six of the ten world’s largest ports are in East or S.E Asia. Intermodal container shipping dramatically changes the international economy. China’s annual GDP per capita growth reaches up to 13% per capitaduring the 1990s. Developing economies can now easily exploit existing containerized supply chains. International supply chains grow more intricate and inclusive, supporting the growth of e-commerce. The first of 14 residential shipping container complexes now built in the UK is completed in 2001. Malcom McLean, the “Father of Containerization”, dies aged eighty-seven. Two books on McLean are published in 2006, marking the 50th anniversary of the first commercial intermodal container service. His achievements have been recognized by the Intl. Maritime Hall of Fame, Fortune and American Heritage magazines, amongst others. HCI markets the 4FOLD foldable container. Others follow, including Staxxon fold and nest containers, Ferrini lightweight collapsible containers, and Cakeboxx doorless containers. Potential new generation of containers, reducing the cost of unproductive repositioning and storage of empty containers, or maximising load space. Raleigh-Durham-Cary N.C. tops decade’s metro % growth. Employment in advanced economies is free to move to “more liveable” locations. Modern container shipping changes the geography of employment. By 2013, 90% of global trade is seaborne, shipped in 700 million containers every year. In 2014, the shipping ports of America received $1.73 trillion worth of goods. In 2010, Freight Farms establishes the first use of containers for agriculture. Containers are now also re-purposed for disaster relief, and even backdrops for K-pop videos. The tech industry follows suit – Google creates a $35 million boat made of shipping containers that uses shipping containers for servers that power the tech giant’s search capabilities. China surpasses Japan as the world’s second largest economy. It then overtakes the US in 2014. Modern container shipping is changing the world structure. Use of remote tracking systems in containers is expected to reach over one million. New technology is improving service reliability. Get instant freight quotes for container shipping now.